On November 22, 2013 Orex von Tajgetosz passed the Begleitenhund (BH) temperament test at the Bur Oak Hundersport Club Trial in Long Grove, IL. Orex and Sherri were required to be at the trial by 9:30 AM but did not go onto the field until 2 PM. The temperature was 34 degrees with winds blowing 7-10 mph for a wind-chill of 19. As is normal at trials, there was minimal shelter available, Orex napped in the truck and Sherri was very glad to have SAR clothes. There were approximately 15 dogs and handlers entered just for their BH. What is Required in the BH? There are two phases to the BH. The control or obedience phase and the traffic phase. The handler must demonstrate adequate control of the dog in a set obedience routine to go on to the traffic phase. The judge is looking for a happy confident dog that not only obeys but enjoys being on the field and working for its handler. 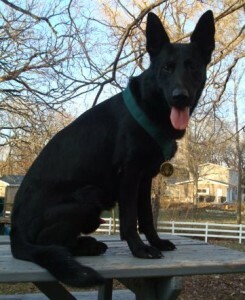 Greater precision in the obedience routine is require to earn an IPO title than the BH. Handlers must heel the length of the field, execute an about turn and heel at normal, fast, slow and normal pace. Two right turns, separated by 15 steps, followed by an about turn and a stop and sit without command are performed on lead as well. The handler then heels the dog into the group, executing a figure 8 around 2 people and stopping next to a third. The dog is heeled out of the group of people, the leash is removed and the group exercise is repeated. The on-lead pattern is repeated off-lead. The handler then heels the dog down the field telling it first to sit and leaves the dog, then returns to heel the dog and down it while going 30 steps away. At the judge’s direction the dog is recalled to a front sit and then to heel where they return to the crowd for the judge’s evaluation. The dogs lined up in a row and began heeling on loose leads. A jogger ran past them, then a cyclist, and finally a car. The car stopped, while playing loud music and the driver spoke to each handler, then opened the door and reached out to shake hands with the handler. The dog was not to react to all of this activity. The dogs were then tied out, the handlers went out of sight and a stranger and then a stranger with a neutral dog approached each dog. Once this was completed, the handlers returned to the dogs. One at a time the dogs were heeled through a crowd, then the crowd closed in on the dog and handler. The judge shook hands with the handler. The dog was put in a down stay and left by the handler and then crowded once more. The dogs which ignored these distractions passed the BH. Orex and all the dogs on German Shepherd Search and Rescue Dog Association (GSSARDA) are required to pass the BH. This demonstrates that the dog can work safely and confidently in unusual and stressful condition without reacting negatively. Any breed of dog or mixed breed of dog is allowed to enter the temperament test. It is designed to identify and cull out poor temperament and potential fear biters. It is fairly representative of day-to-day life in Europe where you might walk to the store with your dog, tie it out or put it in a stay while you shop and then walk home together. Orex performed well and happily, enjoying himself immensely. He can now go on and work on his IPO titles. Congratulations Orex on you BH.